I need to get this information out there and so far my relatively small business doesn’t have the budget that allows mass marketing and advertising. 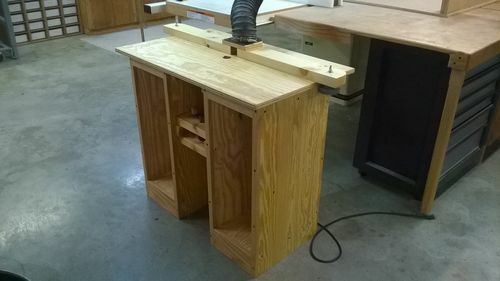 This router lift is completely unique in that it mounts in the cabinet below the the table rather than to the bottom of the table top (or inset). 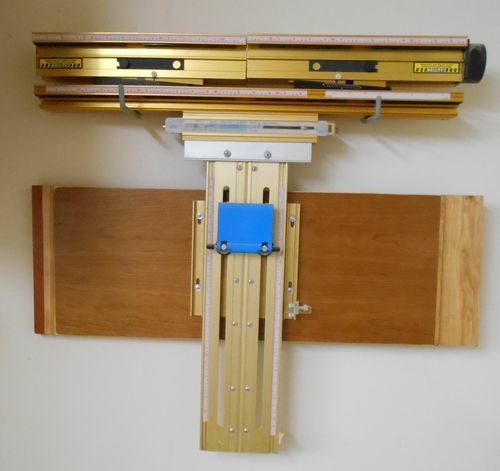 The biggest advantage to this design is that it can be used in a lift top router table! Yep… no more bending over and removing the router motor to change a bit. No more removing the table insert and raising the router to expose the collet and no more moving the fence out of the way. Yes, changing bits is a snap! This lift is solid as a rock and accommodates just about any router motor. The first video below shows the lift and the second one shows the router table I designed for this lift. If you buy the lift I will include the PDF plans for the table in the video. Advertising. Belongs in trade and swap, not reviews, IMO. Router plate- I see a hole in the table top, this I assume is for the router bit to protrude. If so, when lifting and changing bits, is the hole centered to the bit, after lowering the top repeatedly? Insert rings- All that I see, is a “one size” hole in the table top. 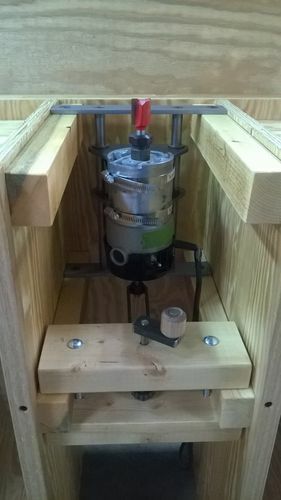 Most router lifts have a variation of insert ring diameters, to accommodate the different size router bits. Example, you start with a .25” straight bit then you switch to a large raised panel bit- One size does not fit all. Chain drive concerns- Yes from the videos, it moves like a Swiss watch. I would like to see it demonstrated with “saw dust” that can easily drop and deposit on the chain, causing resistance in the motion or “clogging. Router fence- I see that you have a simple lumber fence with dust collection. How can this design secure a fence system, such as Incra’s, to the table top and “repeatedly” be moved securely without becoming dislodged? Hey Rick, great idea but I don’t see Trades and Swaps??? Thanks for your input. It’s good to hear, good or bad. Let me address these one at a time. First, the chain drive. Admittedly wood chips could clog the chain but in never seems to happen. 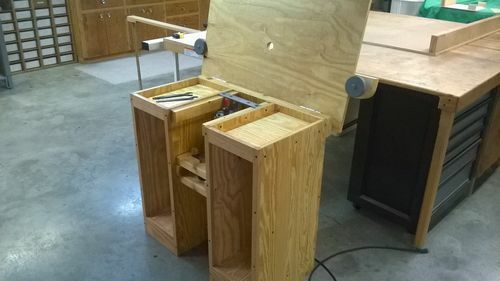 I haven’t used this particular router table much yet but I did build another one with a similar design and it has never a problem (see my projects). In fact, the chain drive is much less prone to problem than the Exacta lift I used to have. It had a timing belt drive that clogged frequently, which is in fact why I went with the chain drive. Dust doesn’t seem to clog a chain drive (maybe the chip size is small enough?). The other table with the same drive system has been in used over a year now (probably hundreds of hours!) with no sign of sawdust in the chain, it simply is not a problem. With the timing belt very fine dust build up would be a major problem. The table insert. Again I learned with the experience with my first lift top table and even the Exacta lift. I made a plastic insert for the last table but I have never had to change it or remove it. The only time this might be an issue is if I enlarge the hole a panel raising bit. With all other bits the clearances remain minimal. The maximum most people use is maybe 1 1/2” and a smaller bit it in a hole this size are most often not an issue. Personally I don’t like the panel bits but if a person wants to use them they can make an insert for the table. I mean after all, this is a DIY project and doing so would not be that difficult. The band clamps. I’m not at all concerned with changing the bits and getting cut. You are nowhere near the clamps while changing a bit. HOWEVER, there is some concern about this happening when you make a height adjustment with the hand crank. And thanks for the nudge on this topic. I meant to bring this up in the instructions I put with the lift. If you install the clamps right this is not an issue but I do need to mention this in the instructions. Fence. The fence I designed works perfectly and is very secure but if a person want to install something like and Incra it would be very easy to do. This is why the fence is covered in a separate video, it’s up to the builder as to which fence they want to use. There is something to be said for keeping things simple. Personally I have no problem making small accurate adjustments with this fence design. And again, compared to the Exacta lift fence mine is fantastic! The only thing I really miss a little on this table is a miter slot in the table… which of course would be an easy DIY addition. My last table had the ideal set up in this regard. Never mind Rick, I found the Trade and Swap. And thanks! Mork- thanks for the reply. It is obivous that a lot effort went into this design best to you and others who are trying to improve “woodworking”. Interesting. It wouldn’t be hard to fabricate a dust cover or shroud for the chain drive mechanism. For sure the lift is not perfect but ultimately it is better than most on the market, at least in some respects. Quite honestly the chain is not a problem, or at least I have never had a problem with saw dust in the chain. With that said, you are correct, simply putting a wood barrier above the chain might work. If you made the barrier full width it would seal the area a little better and you could put a dust collection port in the back and split the dust collection between the bottom and fence. 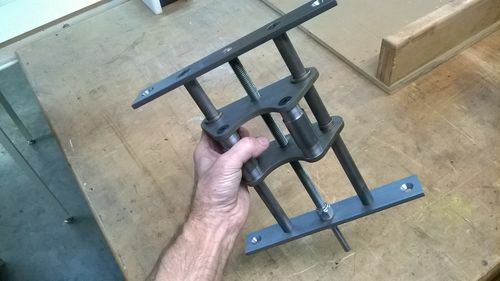 The biggest plus to this design is it works with a lift top design which makes changing bit very easy and quick and way easier than any other router lift on the market. The only real negative I see besides the fact that it doesn’t have a pretty paint job is that it takes time to remove and install the router. This design really needs a dedicated router. I never remove mine. playingwithmywood – Apparently you missed my reply to Ricks polite comment. I totally agree, I should have put this in a different area. And… I’m sure your Triton router with the built in lift is quite nice but calling my Lift “a stupid investment” is not really a fair evaluation, and in my opinion uncalled for. I’m not going to try and argue the positive aspects of my lift other than to say that the two investments are not really comparable and what something is worth is a mater of perspective. I am offering a competently unique product that is not large scale mass production. This in itself doesn’t make it worth more but it’s unique function does, at least to some. If I could lower the price I would certainly do so. I m not going to try and argue the positive aspects of my lift other than to say that the two investments are not really comparable and what something is worth is a mater of perspective. Sorry, I defended my product quite well in the review, apparently you did not read what I wrote. The advantage of this design is very clear. I’m sure the Triton is a good router especially if you need a plunge router or need the extra power for huge bits. The fact is, I can’t remember a time when my 2 hp wasn’t enough or when I actually needed a plunge router. Again, I am not trying to bash your router. Simply put, it comes down to what you need or desire and not what is “stupid”. One question? Can you change the bit in your router without removing the router from the base?